The warms days increase on April and there are a lot of instances when you want to go out in a Kimono. 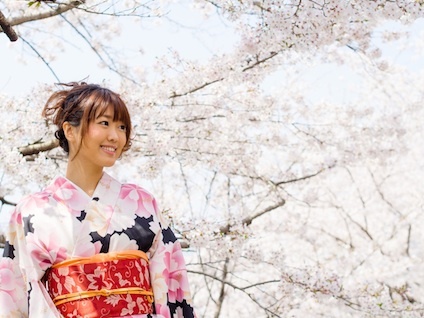 The kimono is also suitable for cherry-blossom viewing events, but we do not recommend it if you will spread it on the leisure sheet when drinking. We recommend a cotton and wool Kimono if you will still be going to a cherry-blossom viewing event. It has been popular as an everyday wear for a long time, you can wash it yourself, it can be ironed, and you won’t be bothered about a little bit of dirt and wrinkles. But the people wearing Kimono everyday has gradually decreased. Due to this, the cotton and wool Kimono is hard to obtain and it would be a good opportunity if it is something handed down from your mother or grandmother. In addition, some people hate wearing a kimono and obi for the cherry-blossom viewing and some view it as being inelegant. It’s like the meaning of the flowers drawn to painting is something that is not possible in real flowers, and you do not need to dress that way just to be hated. That kind of kimono and obi can be worn another time such as during a dinner party or a walk in town. And the picture of this period, which are popular in addition to the cherry tree, are finished with peony and wisteria.